Yanda Canada Ltd., provider of specialised fabrication and installation services and products, was contracted for pressure testing vessels and interconnecting piping at Praxair’s newest air separation facility in Alberta. In order to run the tests, 100% oil-free, high-pressure air would be needed and Atlas Copco Rental was selected as the preferred provider. This new facility will provide Oxygen, Nitrogen, Argon, Hydrogen and other common gasses utilising a 40,000 Hp compressor as its key piece of equipment. Exchangers, interconnecting piping and multiple vessels needed to be tested with ranges from 1,000 to 296,000 cubic feet and at pressures from 15 to 1,700 psi. 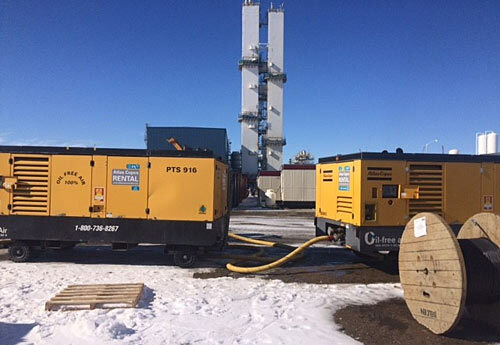 Yanda Canada’s project manager, Rob Hamilton, set up a range of tests needing a variety of air treatment equipment products leading him to call Atlas Copco Rental for an ideal solution. When high pressure air is needed, boosters are used to significantly increase pressure range. The only problem with using boosters for this job is they use oil to lubricate pistons – increasing the risk of contamination for the end product. It was important to ensure oil-free air to eliminate this risk therefore the Atlas Copco Rental team used a filter pack with the booster to remove up to 99.9% of oil in the air stream. Additionally, a second filter pack was added to catch any containment and provide oil-free air. During the start-up and on-site equipment testing, Praxair used a white cloth swap at the outlet and tested the cloth under black light to find there was no contamination. The project offered a valuable learning experience for the Atlas Copco Rental Canada team and harboured a great working relationship with Yanda. Tags: Atlas Copco, Atlas Copco Rental, Yanda Canada Ltd.